An aerial picture made on September 12th, 1944. 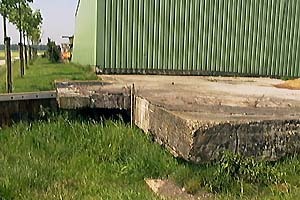 A still present foundation (F3) of the Auswertung T-Baracke. The English introduced 'Window', clouds of aluminium strips which blinded the German radar, in juli 1943. By this, the German Himmelbettverfahren became virtually worthless. Also, the system was not designed for large bomber formations passing through one area. Already on December 14th, 1943 at 10.00 AM the telephone connection (4 double lines?) of the radarstation was disconnected. It must be concluded the radarstation was no longer in use from then on. Other data shows the connection was disconnected at 1.00 PM on April 27th, 1944 but perhaps this was another line. Resistance group Albrecht reports there were about 100 men present until december 1943. Thereafter 15 men stayed, probably guards, who deserted the station on March 11th, 1944. The closure must also have been because of the introduction of new radar systems from late 1943 on. Because of technical improvements less radarstations were needed. Also, the Fliegerhorst Schiphol was no longer used for (night)fighters since december 1943: a heavy Allied bombing raid took place on December 13th. The radarstation was dismantled by the Germans around 'Mad Tuesday', early September 1944. An aerial picture of September 17th, 1944 shows all large buildings were demolished. The inventory and all material needed to be moved, were stacked along the access road. On February 15th, 1945 all materials were gone and 'Seeadler' appeared abandoned. Where the apparatus like the antenna dishes went to, is not known. After te war, several dishes from other stations were used for astronomical and communication research. 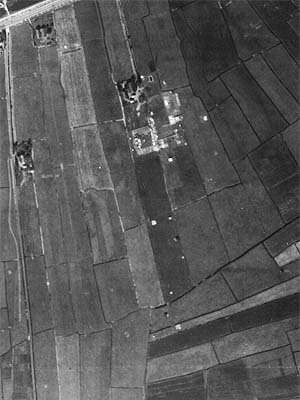 For example, three parabolic-antennas were placed near Nederhorst den Berg, which is closeby to 'Seeadler'. It is remarkable the current situation is the same as it was in February 1945. All small 'garages', the Würzburg Riese socles and two tower foundations are still present. Of building G2 the inside walls were removed and the roof is now instable. Also, building G4 tumbled in in August 2001. Because the radarstation was only operational for a short period, from July 1943 to December 1943, it is not surprising not much is known about this station.